Sacraments are visible and effective acts instituted by God. A sacrament includes both word and symbol. The central symbol in the celebration of baptism is water. Water is the primary element of life. But water can also be a threat to life. In water life can be submerged and brought to an end. In this water rite of baptism, those who are baptised undergo a symbolical experience of what Jesus Christ went through. Just as he achieved eternal life through undergoing death, so the water flows over the person being baptised, who then “rises again” as a having a new life. Concerning baptism, article 76 of the constitution of the Evangelical Church in the Rhineland says: “in accordance with the command of Jesus Christ and trusting in the grace of God, which is the precedent for all that we acknowledge in faith, the church practises baptism and in so doing bears witness to a dedication to the promises of God as revealed in Christ Jesus and the claims of God on the life of the baptised person. 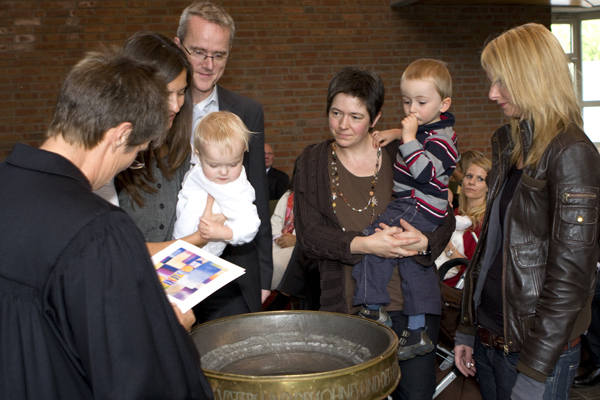 Through baptism, those who are baptised are called to be members of the body of Christ and their membership in the Church is accepted.” In the Rhineland Church baptisms are celebrated in the public worship of the local congregation, in order to make this visible and a shared experience. The person is then received into the local church congregation. At the baptismal service godparents stand alongside those being baptised. Anyone wishing to be a godparent agrees to undertake a responsibility. The mothers and fathers place the godparents into a special relationship with their children. They are expected to play a part in the child’s future life and to accompany him or her on their life’s journey. This accompanying should also involve speaking about the Christian faith. At the baptism service the godparents promise to ensure that their godchild will learn about the Christian faith. Many parents also link godparenting with a request that in the case of their death, the godparents should take their place in caring for any children who are still minors. The role of godparent may include this, but not as a legal requirement. Godparents must be members of a Christian church and must be permitted to be godparents according to the rules of their own church. There is no release from the promises made at the baptismal service, but as a rule the role of godparent ends with the confirmation service of the baptised person. Godparents are not needed in the case of the baptism of young people or adults.